Tactical: Thinking Strategies to play in the Left Defensive Quadrant (LDQ), with specific emphasis on bringing the ball from the left Side (Weak Side) to the Right Side(Strong Side), under pressure. Technical: Role of the Stick Feints, in selling dummies to create space and time to make effective passing / receiving, tactical plays and moves. Strategies and Techniques to bring the ball from the left side of the body to the right. During the 2016 Rio Olympic Games Women’s Gold Medal match between Netherlands – defending Champions - and Great Britain, who dethroned them, and won the Olympic gold medal for the first time in their history, there were approximately 14 Turnovers made by the GB team in the first half in their LDQ. They resulted in a counter attack, free hit or side line hits. This is a huge number of turnovers for a team of this caliber, and that also during the Olympic Games final match. And still win the Olympic Gold medal says a lot about our game and the direction in which it is going. It clearly exposes our weakness while highlighting, what needs to be improved upon, to maintain the possession of the ball under pressure, individually and as a team. This – knowledge gap - is basically for not developing the Soft Skills and Footwork of the players, at a young age. 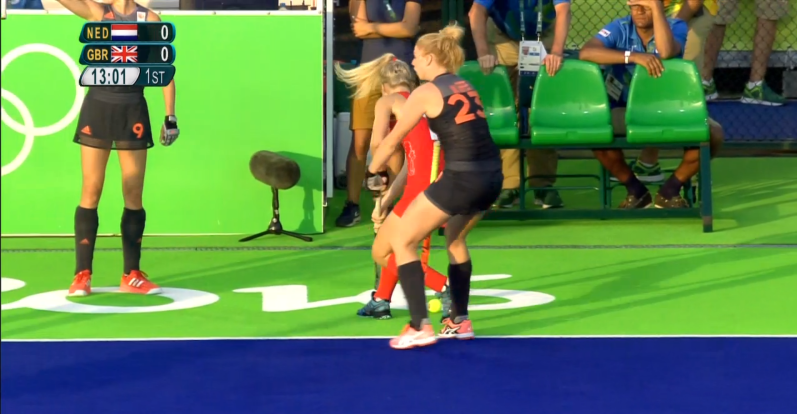 EG, the first penalty stroke awarded to Netherlands had resulted from a TO in the LDQ, and very many more were to come, during the run of play. Why are we trying to bulldoze our way through the opponents and not being fluid like water, which floats smoothly around the rocks, rather than trying to go through it. And with a given time it even melts the rocks. The GB player is in the red. It looks like, as she was trying to spin with the ball clock wise, while forcing her way. Strategies and Tactics while designing a game plan: Another tactical point, which came to my mind, while observing this game was, the way GB kept on passing the ball to their left side, to build the attack, in spite of this many turnovers. This got them into trouble, over and over again. Why was the attack not built from the right side, one’s strong side? Was this a surprise element? Or not observed and corrected in a timely fashion? Pre Rio Olympic Games: As it was mentioned in the Pre Rio Olympic Games article; one of the weaknesses of current generation of players is possession skills under pressure. For reference here are the points which were made. Possession skills under pressure in a confined space. Exactly the above points landed GB team in the hot water again and again, at the same time Netherlands did not have the soft skills and calmness or the tactical awareness to exploit all these TO situations and burn the opponents. This allowed the GB team to swim out of the hot water, against the tide successfully. No wonder Dutch lost their Olympic crown. And the opportunity to be the first team to win 3 Olympic gold medals in a row and hit a hat trick. One of the main reasons for GB to win was also their goalkeeper Maddie Hinch, who played exceptionally well. Just for your reference, the above photo sequence was elaborated in the Pre Rio Olympic Games article. In the previous CNL’s we covered the role of open stick near the left foot of the body and the role of the reverse stick, to optimize one’s game effectiveness. In this issue we will cover the role of stick feints during ball control, passing, receiving and dodging. This is a – another - skill which has not been given its due share and chance to grow, and show its worth. We are taught dribbling the ball in the traditional way, naming it Indian dribble. And in some cases it results in unnecessary over dribbling. Dribbling should be implemented to get one out of trouble and not into the trouble. One of the remedies from the disease of over dribbling is to introduce stick feints, as it encourages the player to look up and scan the field, apart from also controlling and protecting the ball in tight game situations. These days stick feints have gone out of fashion, partly due to the game being played at such a fast pace. One only sees it once in a while, when an outstanding player implements the stick feints, at the right place and time. "Of course players are much faster and fitter nowadays, but they are not so clever on the pitch. It's my opinion that players all do the same things at the same frantic speed, and seem totally unaware as to where their teammates are." Isn't it true even today? You be the judge? The sad part is that, we are still moving/running, even at a more frantic speed today. Forgetting that, Slow and steady wins the race. There is a difference of 12 years, between Athens and Rio Olympic Games, and not much improvement has been seen, to what Paul Litzen's guided us in 2004 to improve upon. Following are the game situations, where one can apply stick feints to harvest rich dividends. We can easily convince ourselves by saying that there is no place for these type of soft skills and stick feints, in the current game, as it is being played at such a fast pace. And this is what I hear even from some top coaches and their players. Nothing can be further from the truth. This is the reason I have analyzed and isolated the game situations, to educate the coaches and players, so they become aware of these skills and know when and where to apply them. How to bring the ball from one’s weak side (Left) to the strong side (Right), in the LDQ. In order to have more passing options and a better view of the field. Avoid teaching the young players spinning in circles. Yes, it sure has a time and place in the game, but has been over used and in fact misused at the wrong time and place. 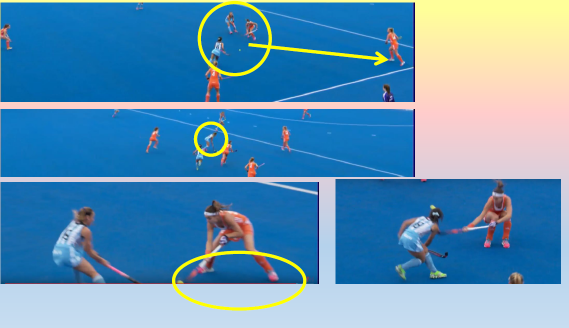 BTW, some of the GB TO in the Rio Olympic Games final match was due to their players spinning in circles in the LDQ, resulting in TO. Expose the young players to stick feints over the ball, with proper footwork. Practice coordination of stick work with stick feints and footwork, while implementing stick feints and stutter steps. Develop these skills in isolation, training in specific game situations, so the players know when and where to apply them. What are you looking for and at in this specific game situation? What are the moves you will implement to take the next step? What has to be done differently to make it work? When one does not identify the problem, it is not going to be easy to fix it and improve. Proper diagnosis is half the cure. Pinpoint the problem and find a solution with a systematic action plan. The challenge we have is that the mindset and skill set of the current generation of coaches and players is different. They do not have many soft skills in their repertoire. In my honest opinion, they are also - a bit too - afraid to take calculated risks in offensive game situations. They think they are safe but are not. Design game simulation situations, where most common and dangerous errors occur, resulting in TO's. this way the players become crystal clear about the dangerous situations, while training and learning strategies to cope with them efficiently and effectively. This way their diagnosis and identification of self created errors will improve. On top of this, create a library of video clips and mental pictures of good and bad strategic plays. In other words, what to do and what not to do?